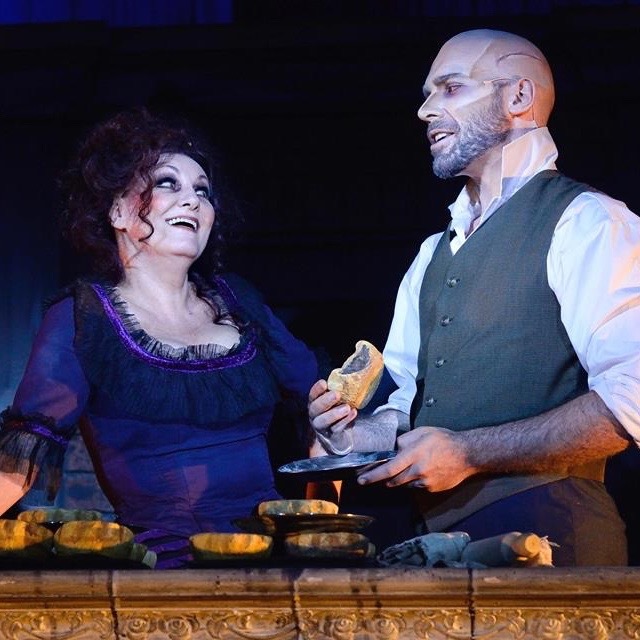 From its menacing start to its unexpected end, Pieter Toerien Productions’ Sweeney Todd: The Demon Barber of Fleet Street is the perfect balance of grisly revenge and morbid humour; everything you could hope to experience in this iconic musical. Featuring a South African cast directed by Steven Stead, all the elements of sound, set, production, costume and cast come together flawlessly to blast the audience with a full-frontal sensory overload. Written in 1979 by Stephen Sondheim and set in 19th century London, the play has a phenomenal soundtrack that the exceptional cast performs with vocal clarity and precision. The music is the undeniable star of the show, from soul-chilling songs like ‘Epiphany’ and ‘Not While I’m Around’ to comical hits like ‘The Worst Pies in London’. Leading the cast as the eccentric, shamelessly flawed Sweeney Todd and Mrs Lovett are Jonathan Roxmouth and Charon Williams-Ros, who masterfully portray these larger-than-life characters with commitment and flare while preserving their humanity. Their strong vocal and acting performances carry the storyline from start to finish and they have plenty of charisma and charm to keep the audience captivated. They handle Sondheim’s complex lyricism with finesse, maintaining impeccable British accents. Watching their onstage relationship develop is gripping, particularly during their rendition of ‘A Little Priest’, where we see a glimpse of Sweeney Todd’s lighter side as he lets Mrs Lovett become a part of his vengeful plan. Roxmouth and Williams-Ros are backed by an outstanding ensemble who meld in and out of the various characters, from street crowds to asylum escapees. They are as integral as the stage design in setting the scene and facilitating the smooth transitions between numbers, delivering world-class vocal cascades as they do so. Jaco van Rensburg was delightful as young Tobias Ragg, and even though his accent slipped once or twice, his open face and naivety made his character’s appeal undeniable. Adam Pelkowitz also stood out vocally as the villain’s sidekick, Beadle Bamford. Greg King’s fantastic set optimises the stage space, creating levels and depth as well as allowing for pathways that transport the audience from room to room, street to street and underground, all on the same stage. This is largely aided by Tina le Roux’s beautifully subtle lighting design, which effectively shifts spaces or eerily lights just the faces of the cast. It’s a superb technical production with top-class performances by a talented South African cast. A must-see for any musical theatre fan. Sweeney Todd: The Demon Barber of Fleet Street is running at Theatre on the Bay until 9 April 2016.